The IBM InfoPrint 1552N is a monochrome laser printer. Designed for small and medium workgroups, this machine can also handle the workload of a large workgroup. As a scalable solution, InfoPrint 1552 features fast print speeds, flexible connectivity, and extensive input and output options. 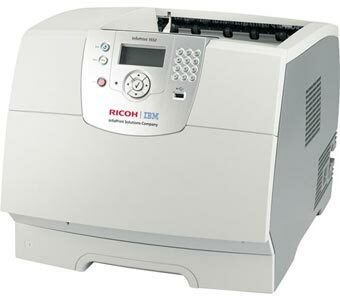 The printing speed reaches 45 pages per minute, which is a bit faster than some laser printers of similar price range. The printing resolution is 1200dpi. This printer can be connected directly into a LAN and serve as its own print server. Other most popular connectivity methods, such as USB, parallel to a PC, or via Ethernet cable, are available. The 802.11 Wireless feature enables InfoPrint 1552N to be easily used in areas that are difficult or impossible to cable. A number of additional sources of input are available up to 4100 sheets total capacity. 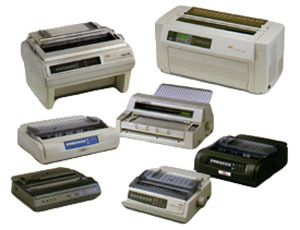 This is more that some laser printers of similar price range have. You can add the 250-sheet drawer, the 500-sheet drawer or the 2, 000-sheet drawer by one or all of them simultaneously. A optional 500-sheet duplex unit is also there to offer two-sided printing for the environment conscious users. IBM InfoPrint 1552 toner cartridges come in various yields and prices, so you can choose which one is right for you. The control panel of the printer is user-friendly and allows even the most technologically inexperienced users to produce projects with ease. Navigational arrows are used to traverse the list/directory tree. The user can easily select the file, choose the number of copies to be printed, and submit the file for printing. The printer features convenient USB Direct Port to print PDF documents quickly and easily. Once a flash drive is inserted in the printer, a list of PDF files and directories is displayed. Navigational arrows are used to traverse the list/directory tree. The user can easily select the file, choose the number of copies to be printed, and submit the file for printing. Although it is possible to connect the InfoPrint 1552 directly into a LAN, viruses are not a problem as no files are executed on the memory device. The files are only read and printed, so no writing to the printer takes place. All in all, this machine is intended for those who need high volume black and white printing and its features are in line with its price.